Please consider signing our petition. 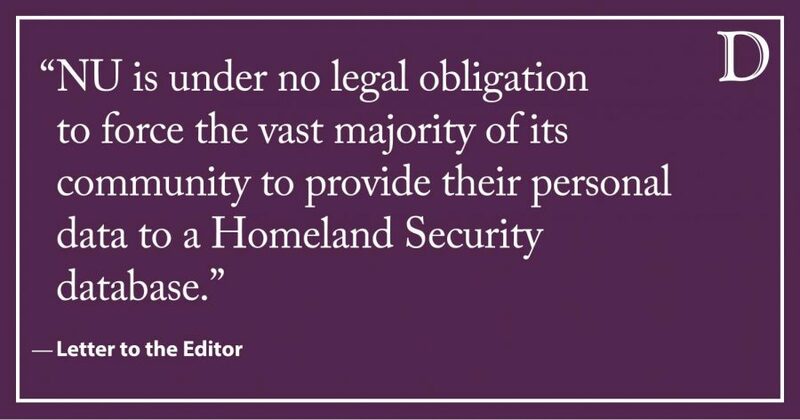 Since 2009, Northwestern faculty, staff and students have voiced concerns about NU implementing a discretionary program that turns over private data from students, staff and faculty to the U.S. Department of Homeland Security through a program called E-Verify. As the timeline on this matter shows, in the last decade, various NU legal and administrative officials have responded to our concerns by misrepresenting the necessity of E-Verify for those not directly employed by government contracts. We now have proof as to the shocking scope of individuals affected at NU and the false claims shared with us about the University’s need to participate. In response to litigation under the Freedom of Information Act, we received the Memorandums of Understanding NU signed to initiate and renew its participation in E-Verify, which then-General Counsel Philip Harris refused to release last spring. Through this litigation, we received national data revealing that NU is the only research university in Illinois to participate campus-wide and that its participation is an extreme outlier: fewer than 1 percent of institutions of higher education have in fact signed these MOUs obligating campus-wide participation. The MOUs with U.S. Citizenship and Immigration Services prove that NU is under no legal obligation to force the vast majority of its community to provide their personal data to a Homeland Security database that, according to the ACLU, poses threats to our privacy and that violates the national criteria proposed for campuses seeking to welcome noncitizens. In sharp contrast with hundreds of research universities in states not obligated to participate in E-Verify, NU forced over 76,000 students, staff and faculty to submit personal information to databases that share their information with third parties. Anyone employed by NU since 2010 is in this database. Our analysis of the USCIS Excel sheet itemizing NU’s submissions of our data reveals that over 190 individuals were specifically targeted by NU for Homeland Security as attempting to work without authorization approved by E-Verify. The final determinations are not yet clear; we expect to receive additional data from this litigation shortly. As the MOUs clearly state, NU can after 30 days notice stop reporting data on all new hires who are not directly working under federal government contract. At that point, everyone who is working on a federal contract will have been already included in the E-Verify database. The only new hires whose data would need to be submitted would be those working directly on a federal contract, which is exactly the situation of our peer institutions. If the University of Chicago (and over 99 percent of other institutions of higher education) can target only new hires working on federal contracts for E-Verify, then there is no logistical impediment to prevent NU from doing this as well. We have been sharing our concerns with President Morton Schapiro and Provost Jonathan Holloway since last spring. On Jan. 8, 2019 we wrote a letter to them stating that, in light of NU’s stated intention to protect the educational opportunities of its noncitizen community and this new information proving the inaccuracy of claims about NU’s obligations to USCIS, we wanted them to reconsider their earlier position. We requested that NU immediately send the 30-day notice of an intent to withdraw from campus-wide participation in E-Verify. President Schapiro and Provost Holloway did not reply, though they regularly opine to The Daily their support of DACA students, a population NU’s own attorney has agreed is at special risk from E-Verify. We write now to ask others to join us in sharing with Schapiro and Holloway your concerns by signing this petition. Added on 2/7/2019: For links to the General Dynamics piece of the NU E-Verify story, please see this 2016 Letter to the Editor. My guess is that Northwestern is submitting to e-Verify solely as a condition to be able to secure extended OPT for its foreign STEM graduates. Thanks for your comment. University of Chicago and 99% of other research universities have foreign STEM students and do not use E-Verify for them unless they are working directly on a federal contract. Several of the signatories of the letter met with a number of NU officials, including their general counsel, the Provost, and folks in Human Resources. Your guess is incorrect. No one said a word about OPT. Instead of assuming that NU is somehow smarter than its peers (hah! ), how about considering the fact that NU's board for decades has been dominated by the founders, directors, and officers of General Dynamics, the firm that in 2007 landed a major contract with USCIS to handle IT for the agency and to literally print the Employment Authorization Documents? Also, OPT https://www.uscis.gov/opt is tied to SEVIS, not E-Verify.